Episode #274: Superman Comic Books Cover Dated April 1962: Superman #152 & Action Comics #287! Superman 152 & Action Comics 287! SUPERMAN 152, April 1962, was published on February 6, 1962. It contained 32 pages for the cover price of 12¢. Mort Weisinger was the editor, and the cover was pencilled by Curt Swan and inked by George Klein, featuring the first story of the issue. All three stories were reprinted in SHOWCASE PRESENTS: SUPERMAN vol. III. - THE ROBOT MASTER (9 pgs. ), written by Jerry Siegel, pencilled by Curt Swan and inked by George Klein. This was Siegel's 39th silver age Superman story, and his 105th overall for the era. Previously, he wrote two stories for ADVENTURE COMICS 294, March 1962: DIAL M FOR MONSTER, drawn by Al Plastino, and THE HALLOWEEN PRANKS OF THE BIZARRO SUPERMEN, pencilled by John forte and inked by George Klein. - SUPERBABY CAPTURES THE PUMPKIN GANG (9 pgs. ), written by Leo Dorfman (according to comics.org) and drawn by George Papp. - THE TV TRAP FOR SUPERMAN (8 pgs. ), written by Bill Finger (according to comics.org) and drawn by Al Plastino. ACTION COMICS 287, April 1962, was published on February 27, 1962 (28 years before my son's birthday). It contained 32 pages for the cover price of 12¢. Mort Weisinger was the editor, and the cover was pencilled by Curt Swan and inked by George Klein, who were the art team for the Superman story in this issue. - The Superman story in this issue was titled, PERRY WHITE'S MANHUNT FOR SUPERMAN (12 pgs. ), writer unknown, was reprinted in SHOWCASE PRESENTS: SUPERMAN vol. III. - Supergirl starred in the 14 page story, SUPERGIRL'S GREATEST CHALLENGE, written by Jerry Siegel and drawn by Jim Mooney. This was Siegel's 67th silver age Superman Family story, and his 106th overall for the era. The story has been reprinted in LEGION OF SUPER-HEROES ARCHIVE vol. I, SHOWCASE PRESENTS: LEGION OF SUPER-HEROES vol. I and SHOWCASE PRESENTS: SUPERGIRL vol. I. Elsewhere in DC Comics, 26 titles carried the April or April/May 1962 cover date. Next Episode: SUPERMAN FAMILY COMIC BOOKS COVER DATED MAY 1959: WORLD'S FINEST COMICS 101 & SUPERMAN'S GIRL FRIEND LOIS LANE 9! In 2 Weeks: SUPERMAN COMIC BOOKS COVER DATED MAY 1962: SUPERMAN 153 7 ACTION COMICS 288! I also do a brief review of BILLION DOLLAR BATMAN by Bruce Scivally. Why is Batman discussed on a Superman podcast? Because on radio, Batman only appeared in episodes of the ADVENTURES OF SUPERMAN radio show. When we all get home after our day trip through the time barrier to the silver age adventures of Superman, let's all remember to take care of each other out there. - The COMERMAN PODCAST NETWORK at http://supermanpodcastnetwork ! Episode #273: Superman Family Comic Books Cover Dated April 1959: Superman's Girl Friend Lois Lane #8 & Superman's Pal Jimmy Olsen #36! Superman's Girl Friend Lois Lane 9 & Superman's Pal Jimmy Olsen 36! SUPERMAN'S GIRL FRIEND LOIS LANE 8, April 1959, was published around February 12, 1959. It contained 32 pages for the cover price of 10¢. The editor was Mort Weisinger, and the cover was pencilled by Curt Swan and inked by Stan Kaye. All three stories have been reprinted in SHOWCASE PRESENTS: SUPERMAN FAMILY vol. III and SUPERMAN'S GIRL FRIEND LOIS LANE ARCHIVE vol. I. - THE SUPERWOMAN OF METROPOLIS (8 pgs. ), written by Alvin Schwartz (according to comics.org) and drawn by Kurt Schaffenberger. THE UGLY SUPERMAN (9 pgs. ), written by Robert Bernstein (again according to comics.org) and drawn by Kurt Schaffenberger. This story was also reprinted in SUPERMAN ANNUAL 3, covered back in Episode 248, and in SUPERMAN IN THE FIFTIES. - QUEEN FOR A DAY (9 pgs. ), written by Robert Bernstein (according to comics.org) and pencilled by Wayne Boring. Dcindexes.com lists the inker as Stan Kaye, while comics.org names the inker as possibly John Giunta. SUPERMAN'S PAL JIMMY OLSEN 36, April 1959, was published around February 19, 1959. The issue contained 32 pages for the cover price of a dime. Mort Weisinger was the editor, and the cover was pencilled by Curt Swan and inked by Stan Kaye. It featured the issue's third and final story on the cover. All three stories have been reprinted in SHOWCASE PRESENTS: SUPERMAN FAMILY vol. III. - SUPER SENOR'S PAL (9 pgs. ), written by Otto Binder, pencilled by Curt Swan and inked by Ray Burnley. - LOIS LANE'S SISTER (9 pgs. 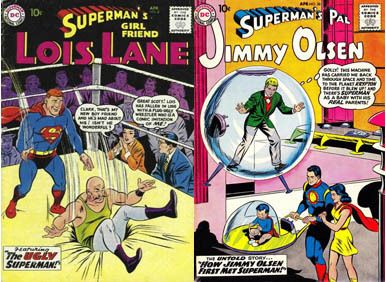 ), written by Otto Binder, pencilled by Curt Swan and inked by Stan Kaye..
- HOW JIMMY OLSEN FIRST MET SUPERMAN (8 pgs. ), written by Otto Binder, pencilled by Curt Swan and inked by Ray Burnley. This story was also reprinted in SUPERMAN ANNUAL 5. Elsewhere in DC Comics, 32 titles carried the April or April/May 1959 cover date, according to Mike's Amazing World Of DC Comics. They were featured at the end of Episode 186. 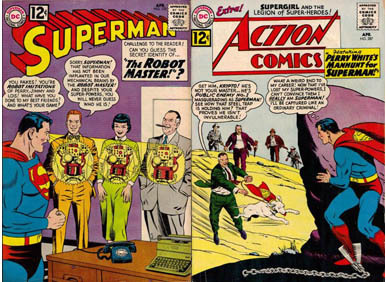 Next Episode: SUPERMAN COMIC BOOKS COVER DATED APRIL 1962: SUPERMAN 152 & ACTION COMICS 287! In 2 Weeks: SUPERMAN FAMILY COMIC BOOKS COVER DATED MAY 1959: WORLD'S FINEST COMICS 101 & SUPERMAN'S GIRL FRIEND LOIS LANE 9!